In an unbylined 11:31 a.m. Eastern Time dispatch Saturday, the Associated Press demonstrated why anyone trying to get to the truth about the status of the Hillary Clinton's private server-scandal — which is clearly not over, and clearly has not been "litigated a million times," as CNN's desperate Don Lemon claimed on Thursday in shouting down a conservative panelist — needs to go somewhere else to find it. The AP report's most obvious Democratic Party talking points-inspired spins attempted to make a distinction which shouldn't make a difference about the nature of the classified emails found on former congressman Anthony Weiner's laptop, and deliberately mischaracterized former FBI Director James Comey's November 6, 2016 letter to Congress re-closing what had been a closed investigation nine days earlier. ... Clinton rationalizes that because the emails were not stamped classified, she could not have been expected to know they were classified. As I’ve been emphasizing since March, she is trying to exploit the public’s unfamiliarity with the distinction between classified documents and classified information – the former are obviously classified because they are marked as such; the latter, because of its nature, is well known to national security officials to be classified – regardless of whether it is marked as such or even written down at all. ... Mrs. Clinton (had) undeniable knowledge that she was pervasively exchanging classified information over her private email system. That is, unless your name is Hillary Clinton, and your FBI Director at the time you should have been criminally charged was James Comey, who was being "helped" in ensuring that no charges would be filed by Hillary fan and rabid Trump-hater Peter Strzok. 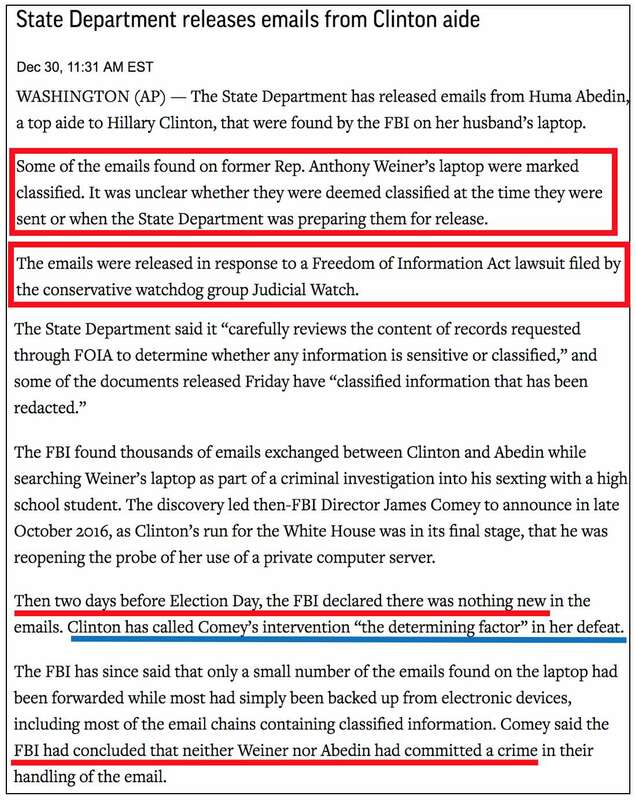 As to Judicial Watch's FOIA request, the AP failed to disclose that JW's original "Freedom Of Information Act lawsuit that resulted in Friday's coming document-dump was filed in May 2015," over 2-1/2 years ago. Also note that the State Department released these emails on the Friday afternoon before what is probably the year's lowest-interest news weekend. The AP's breezy declaration that "the FBI declared that there was nothing new" is not what Comey's November 6, 2016 letter said. In the context of events which have since transpired, it's reasonable to believe that the "nothing new" claim is false. "We have not changed our conclusions" is most certainly not the same as saying that there is "nothing new." Perhaps it's not a stretch to reach that assessment when reported by a responsible law enforcement officer, but based on what we've seen of him since the election, no one can reasonably contend that Comey now fits that description. We now know that Comey has, at a minimum, lied to the American people about the lack of criminal intent on the part of Mrs. Clinton and her apparatchiks, who deleted emails under subpoena; ensured that a pliant FBI would destroy the laptops of key potential witnesses; and leaked information to the press without authorization. The AP's blind assumption that Comey's November 6, 2016 letter showed that there was "nothing new" is completely unwarranted. As to whether Abedin and Weiner committed crimes, the same logic applies to them as applied to Mrs. Clinton. Based on the statutes involved, they committed crimes; that the Department of Justice and FBI failed to prosecute them doesn't change that obvious fact. As to the blue line added to the AP report, that "Comey was the determining factor" in Hillary Clinton's defeat, boo-freaking-hoo. It's all Mrs. Clinton's fault for having the private server in the first place. Once you commit brazenly illegal acts, you're in no position to complain about their unfortunate consequences.